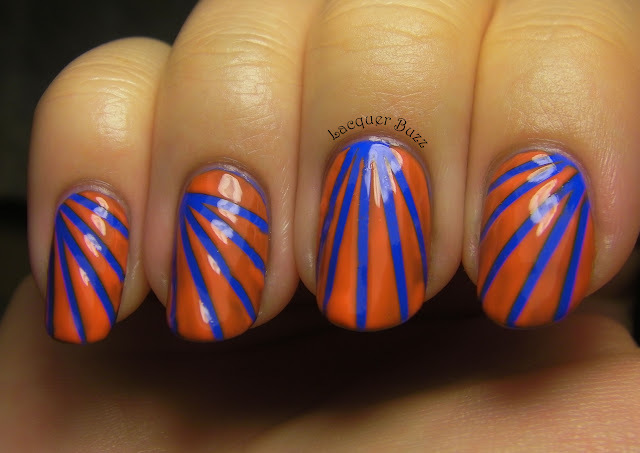 Lacquer Buzz: Girly Girl Nail Art Challenge Day 8: Girls Just Wanna Have Fun! 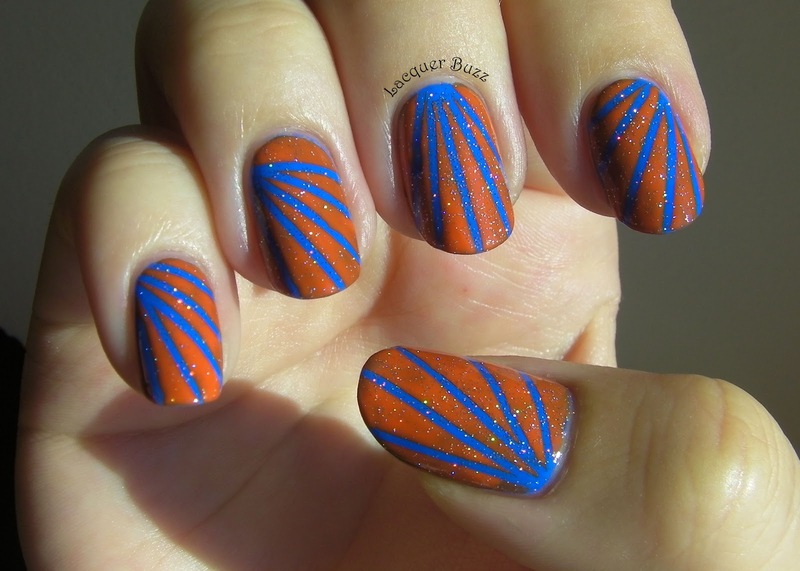 Girly Girl Nail Art Challenge Day 8: Girls Just Wanna Have Fun! Hello loves! How is your Sunday going so far? I'm excited to show you the second fun nail art of this weekend, which is also the last of the Girly Girl challenges. I can't believe that I'm already done with this challenge. Time has flown by so fast! It was a lot of fun and I loved stepping out of my comfort zone for a bit because some of the themes were not what I'm used to. If you want to see all the posts in this challenge you can click here. 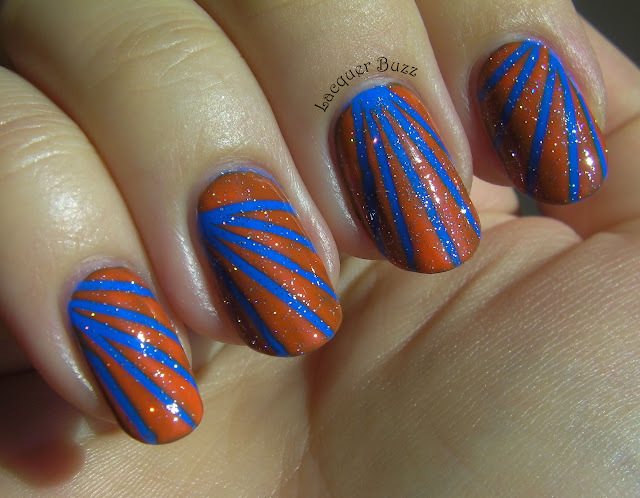 For today's post we had to demonstrate how fun-loving we are, so I did a tape mani with one of my favorite color combos, blue and orange. Both of these colors are bright and in your face, and I've also added some glitter, so this manicure is beyond fun. I started with a base of H&M Blue My Mind, which you can see on its own here. 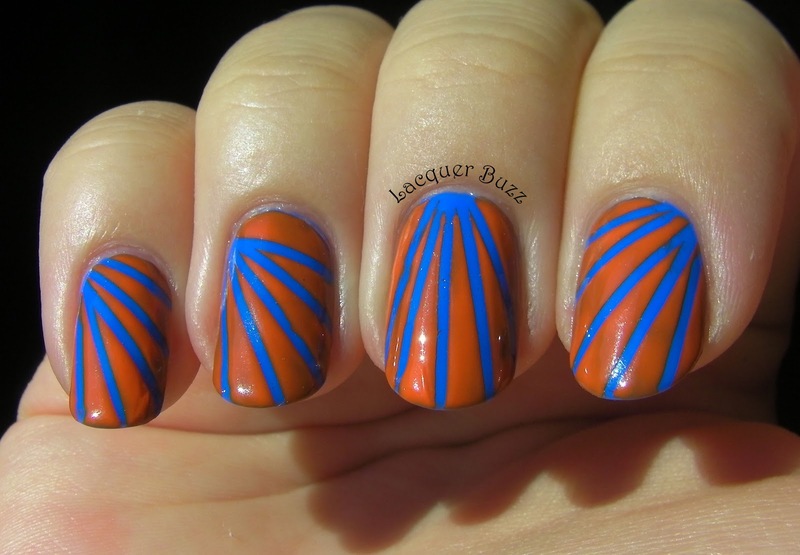 I then used some striping tape to create diagonal lines across the nail and painted Rimmel Tangerine Queen over them. Unfortunately this was pretty sheer and streaky, so the end result didn't look so good. So to make it better I added one coat of my favorite holo glitter, INM Northern Lights. This instantly makes everything look good. I love it! Thank you for reading! Make sure you check out what the other ladies in the challenge have come up with for today's theme! I love this!!! It looks perfect!